Just a little note wishing everyone happiness and safety before I fly out very early tomorrow morning. Last night, I had a phone call from a very dear friend, Oy, who lives in Thailand. Oy will meet us at the airport in Phuket at 2pm tomorrow. Our whole family loves Oy and we were hoping to catch up with her, so this is a wonderful surprise! I am at sixes and sevens about my feelings and emotions regarding this holiday as Mum is still in hospital. However, social workers talked to me for a couple of hours yesterday and convinced me it is the right thing to do. Mum is at peace with my going and I really hope to help the family have lots of fun, especially the little ones, Heidi and Byron. Happy stitching while I'm away - God Bless! Having spent quite a bit of time visiting blogs and drinking coffee, I really must get my act into gear and go visit Mum. It has been a very relaxed, stress-free way to start the day! Thought I would leave you with happy thoughts of quilting today - for some reason I just love this simple quilt made by Bonnie and I believe it will feature in her soon-to-be-released book, Scraps & Shirtails. They say "less is better" and this is probably a classic case of that - to me there seems to be some sort of vintage appeal and I can't wait to put my own special touch to it. Again, a short post and thanks for your best wishes. I am not long home from the hospital and it is beautiful outside - makes me feel like gardening, but I'll just walk the puppies instead. Unfortunately, Mum has not improved and is very tired. My heart aches, but acceptance is coming - to both of us, I think! I am so lucky to have such a supportive family and friends. I would like to respond to every one individually and will try to do so, but time is running short on me and there is so much red tape to sort out and arrangements to try to make. 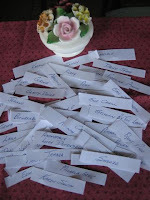 Not long to the lucky draw on Monday and one day I will sit down and go through everyone's blogs - have had a few sneak peaks and there sure is a lot of talent and fun out there - so glad to be part of it all. Hope the sun is shining for you all - hugs! Just a brief posting today to keep you up to date ... My World is very topsy-turvy at the moment! I'm still not feeling well and I believe there are a lot of others like me - just a nasty bug going about, so I WILL get better. Things are not at all good with my Mum and seems she will have to go into a nursing home and I am not coping with this, as I had hoped the day would never come. Be happy and keep stitching - hugs! Hello all - feeling quilt a lot better today, so let's hope it stays that way! I have decided I would like to do the Give-away for my 100th Post (now 105) before I go on holiday, even though it is only a fairly short one. The gift will be the Cathedral Window Bag that I made a little while ago. It has been so lovely being in touch with so many new folk since the start of blogging in April - also, catching up with "old" (not in years) friends. We do have so much fun and it has been wonderful being part of Quiltville Chat and having a renewed interest in Scquilters. I must say that I do less sewing these days, though, but all that will keep. The bag is approximately 11" high by 10" wide and is fully lined and I have made little pockets inside for car keys, lippie and mobile phone. A lot of friends here in Perth have followed suit and tote their bags everywhere. Me, I sling around faithful larger leather bags, which I must admit get very untidy at times, as Julia will tell you. I will close off for those who would like to participate early next Monday morning 25 August. Hopefully, I will be able to email the lucky person and to get your address and post the bag to you before I fly out on Friday morning. Please let your friends know - especially Quiltville Chatters and Scquilters and I'm happy to make new friends, too. It has been just wonderful keeping in touch with you all and we all inspire each other, I am sure. 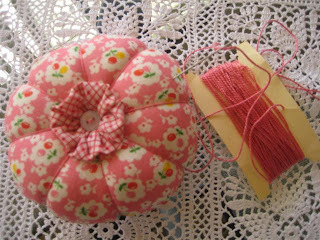 Wow, just look at my recent cute little pincushion I made. Dear Daughter, Danielle, has claimed that already! Must get ready to pop up and see Mum in hospital to see how things are going there. I have been a bit quiet this week! Nasty 'flu bugs do fly about at this time of year and this one has not been kind. I keep thinking, maybe tomorrow will be better. I have also had to put Mum into hospital as her legs have gone on her, so it's a matter of day-by-daying it! As they say ... laugh and the world laughs with you ... so let's move on. I have tried to make a little something as this will be my 105th post - Candace doing a give-away for her 100th post has pricked my conscience - however, I haven't quite made it. With what there is to do and the Thailand holiday coming up, perhaps I will have to postpone it a bit. 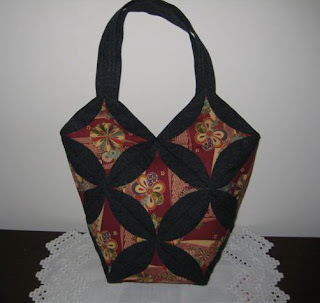 The carpetbag above was made by a very dear friend, Joy Cooper, from the Rockingham Patchwork Group. Joy is either 84 or 86 and a lot of the girls in our group have bought the bags from her and also a couple of my friends have bought them. Isn't Joy just amazing with her achievements and she puts so much thought into where every little patch goes in the bags. They are beautifully lined and very, very strong. Joy is a very aristocratic lady, and one doesn't come across too many these days. Coupled with such dignity, she has a wicked sense of humour and can be girlishly brazen at time - a delight to be around! Emily was taken out of the display cabinet so she could show how beautiful she is. I sometimes wonder how I had the patience to put so much detail into my dollies. 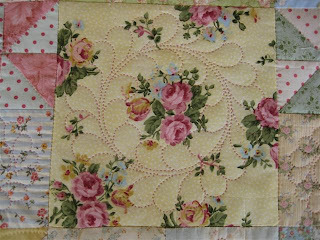 I must say they were great days, but quilting took over and it is so much more portable and sociable. It is an absolutely beautiful day out there, but I'm going to be a lounge lizard in front of tele and watch some of the Olympic Games and work on by Babette Blanket. 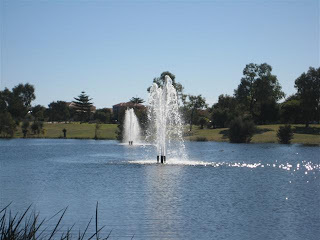 It was a lovely walk around the lake on Monday - warm sunshine and pretty views of ducks, fountains and blackboy trees. It was very quiet and serene and the puppies frolicked along trying to chase the ducks. 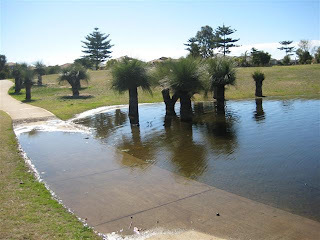 I think I have given the wrong impression to some folks - this lake is not on our property - we are definitely in suburbia. However, we are lucky to have this lovely lake just a very short walk from our front door. 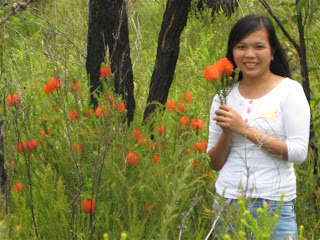 The blackboy trees are native to Australia and not seen in many cities - they are very impressive, so it is nice to have them in our locale. 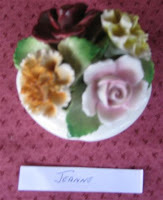 Yesterday I had my first attempt at making delightful little pincushions that I first saw on Chookyblue's blog. Now, Donna is busy doing the Secret Santa Swap and I happened across the pincushions on Darlene's blog and she kindly steered me towards a tutorial, thanks Darlene. 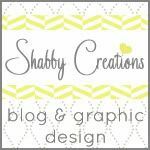 These girls have great blogs, so do visit! I am reasonably happy with the outcome - not perfect, but cute - and easy to make - a lot of fun! I'm still confined to quarters with the flu, so it will be a quiet week for me - not at all to my liking! 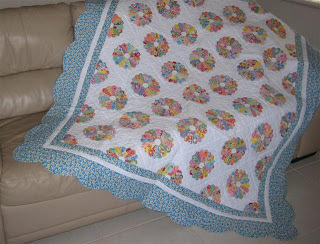 I have been so busy with my Babette Blanket, I have almost forgotten I am a quilter! This is a quilt-as-you-go quilt I started perhaps 18 months ago - it has 9 blocks at 24" and I call it my "Not-So Shabby Chic" quilt. I have only a tiny bit of quilting to do on the last block, then the assembly will start. I have mislaid? the fabric for sashing strips, so will have to get to and find it and get the jolly quilt finished. It will be queen-sized when border is added. The lower picture is a closeup of the hand-quilting. Maybe I will think about finishing it, after I have had a 10-day holiday in Thailand later this/early next month. The holiday will be most welcome as it has been a cold winter here and at the moment I'm not feeling exactly "on top of the world" - Mum is slipping with every day, so we have a few issues to sort out. 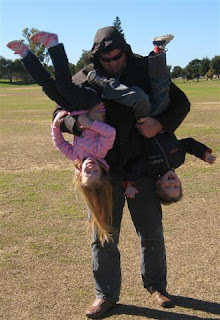 Never mind, here is Uncle Ben having fun with Heidi and Byron at the footy on Saturday - the kids just LOVE Uncle Ben and who wouldn't having this much fun! The little ones had a great weekend with footy then a sleep-over. I did brave footy for most of the day on Saturday - a bit silly, I think, and it was so cold and windy in the morning - not exactly too sensible when one has a cold/'flu bug! 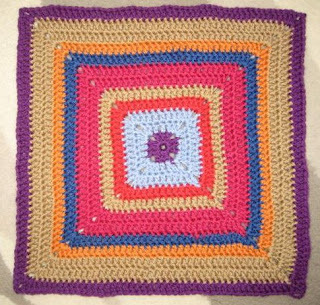 I have also tried to spend as much time as I can with Mum, consequently made quite a lot of progress over the weekend on my Babette Blanket. Must say we are enjoying the coverage of the Olympic Games. I have itchy fingers today, do hope I feel like doing some machine sewing tomorrow - am keen to do a few more CWLL blocks and also to make cute little pincushions. It is early afternoon and there is beautiful sunshine out there, so will take the puppies for a walk and "think about everything tomorrow"! My goodness ... this is so quick! 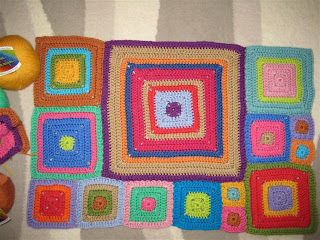 I know a few people are following progress on my Babette Blanket, so here is the latest. I can't believe how I can really see what I achieve in a short time - not like hand-quilting or applique. 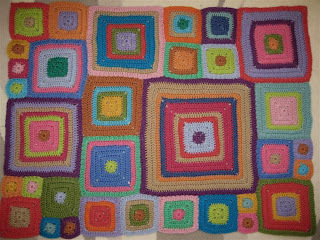 I didn't get any sewing done yesterday, but had a lovely day relaxing with my crochet. The colours I have chosen are bright, but I don't think quite as bright as they are showing here. The wool, I could not be happier - so soft and the drape is beautiful. Today I am having a quiet one at home - I hope! My mother, who lives with us and who turns 90 in October seems to be slipping a bit and I really should spend more time with her, so I will have a happy day doing that. 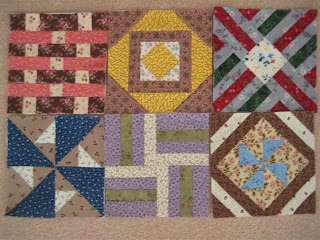 Above are the last lot of CWLL blocks I have done - seem to be having a few restarts these days. I felt the lights were standing out too much in the last lot, so I have used different scrappy lights and it seems to have broken it up a bit, so I am happier with this lot. 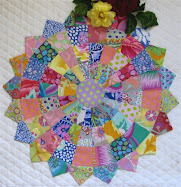 Am thinking, maybe I will get in and do at least one more complicated block today - we'll see! This is Restart 3 on Babette Blanket and I am really happy with the track I am on this time, using the lovely Biggan merino wool - just beautiful. I made a lot of progress on it yesterday and hopefully will have a lot more progress to show, maybe tomorrow. Yesterday we had a great day at Julia's - supposedly a quilters' group - all but one, Gwen, knitted or crocheted. 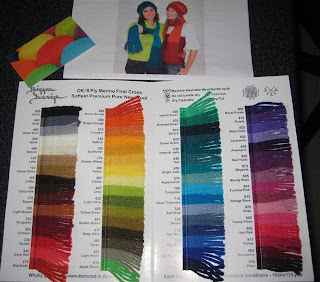 We had great discussions on what hooks and yarns we are using or should be using, so funny being a quilting group. Must be the cold weather getting to us all. Julia prepared a beautiful lunch for us, with a choice of lasagne or canneloni and lovely salads. 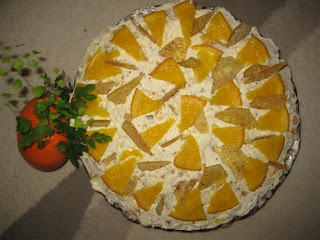 Of course we had our usual lot of delights for morning tea and I took along the Orange Hazelnut Gateau for sweets after lunch. Peggy, from our Thursday group had given me the recipe and I'm pleased with it - something different, with a touch of Cointreau. A tinge of sadness - Jan and Bill, our Gallivantourists, drive out next Monday, so we will miss our dear Jan at our gatherings - they are setting off on their big journey - 3 years! However, they will briefly return at Christmas, so we can't be too sad. See my sidebar - I am in Chookyblue's Santa Swap 2008 - am pleased about that - should be a lot of fun. A lot of talk today, so must away, Mum is out of bed and having her coffee now, so I will go and have a little chat. I have a lot to talk about today - those who know me well would say "That would be right!" 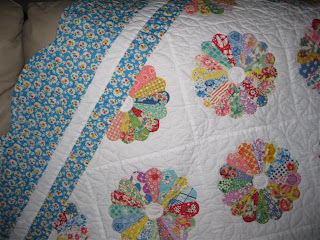 Thought I would show you my Dresden Plate Quilt, made and exhibited in May 2006. 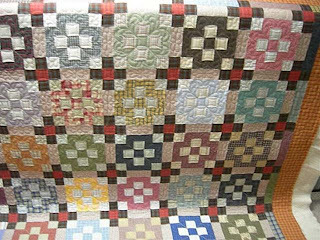 I have used feedsack fabrics, reproduced from the 1930's, it is hand pieced and hand quilted. 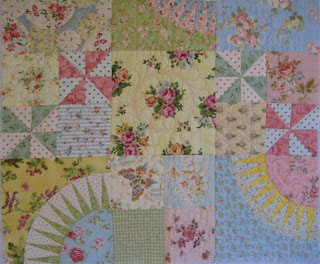 It was just so lovely to make - playing with all the pretty fabrics of those times. 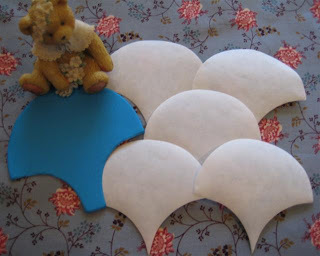 The scalloped border was a bit of a challenge, but fudged, semi-accurate maths won out at the end of the day. Yesterday, Robin and I went to a great Craft Fair at Clarement Showgrounds in Perth. We met up with dear friend, Jan Reid for coffee and lunch, so that was lovely doing the girlie thing. I didn't go with great expectations, so didn't take my camera and that was a real mistake - well, the traders stalls were beautifully displayed and patronised and a lot of the quilts fabulous. There were demonstrations on fabric and textiles and free-form crochet/knitting - very tempting! Robin (naughty girl!) bought me a colour card of a new DK/8Ply Merino First Cross Softest Pure New Wool by Biggan Design. This wool is fully Australian made, made here in Australia, too, and developed by a Swedish lady , Henrietta Dups, who has lived here since 1988. It is just so soft and beautiful and comes in 64 brilliant colours. So, guess what ... another start to my Babette Blanket! I feel sure I am on a winner this time and will keep you posted. For all of us who labouriously do tumbler blocks, apple cores, etc. this is new to me, too. Many shapes are available in die-cut freezer papers and if desired, you can send your own fabrics to be die cut by Judy, The Quilt Fairy. 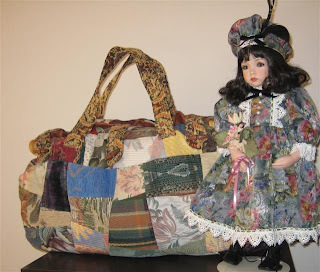 The clamshells are a new release and I hope to send some fabrics to her later this week. I will probably sends a variety of light, mediums and darks in reproduction fabrics. Make sure you visit both websites by clicking on the highlights above.